We had a BLAST at OwlCon 2K2! The Annual Game Convention at Rice University in Houston, Texas was held Feb. 8-10. 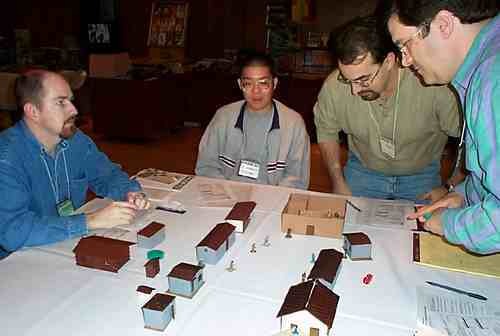 The Gutshot Posse (consisting of Jim Skipper and Mike Mitchell) attended and playtested the latest rules revisions. We learned a LOT from these games. "Bad Day at Beaver Creek, Take Two"
Troy Roper and Jim Skipper look on while John Sponheimer measures the range for "Fritz Sure-Shot." Posse friend John Sponheimer, took time off from running his Website, www.completerpg.com, and paid us a visit. His two figures, "Fritz Sure-Shot" and "Fritz Mastershot," gave us all a run for our dice. Reading the wicked grin on his face as he blew Troy's figure away, it's pretty obvious that he enjoyed finally finding out what Gutshot is all about. "Last One Standing -- Team Play"
Between the five of us playing, we fielded 12 Characters (three of us ran two, two ran three). It was a fast and furious battle between two rival bands out outlaws. Team One (Everett, John, and Mike): Nevada Nell, Injun Joe, Coyote Bob, Cotton King, Fritz Sure-shot, and Kirk the Killer Klaw. 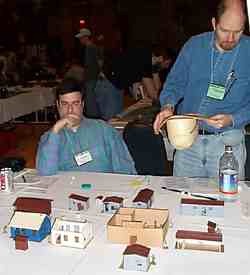 Team Two (Troy and Jim): Slim Jim, Diamond Jim, Slippery Jim Degris, Joe Bob, Deadeye Dan, and Bad Bart. "This here town ain't big enough for the both of us," so one of the gangs had to go. 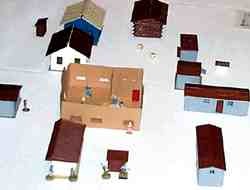 Each player set up his figures anywhere in their half of town. Then all hell broke loose! We placed our figures anywhere we wanted in our half of town. At one end, Nell's Raiders hunkered down behind the privy for a pow-wow, then headed out with guns blazing. At the other end of town, The Bad Boys scattered about, taking refuge in various buildings and started with a cautious, defensive posture. The battle moved from the streets to the saloon and back again. We made good use of the "Partial Cover Rules" as the battle raged on. The "Snake-Eyes" fumble table helped turn the tide of battle as one of Jim's figures had his gun explode in his hand (the result of two consecutive, very bad rolls). The battle moved from the streets to the saloon and back again. We made good use of the "Partial Cover Rules" as the battle raged on. The "Snake-Eyes" fumble table helped turn the tide of battle as one of Jim's figures had his gun explode in his hand (the result of two consecutive, very bad rolls). Bad luck also played a roll... in three different situations the figure had someone at point-blank range with a shotgun... almost impossible to miss! All we needed was to roll a four on two six-siders... and all three times we rolled a three! "Hmmm. If I move Bad Bart over there, I can catch Nell in a crossfire..."
In the end, there could be only one gang in town... and Nevada Nell danced the victory dance as that no-good, yellow-bellied varmint Bad Bart-- the last survivor of his team -- hightailed it out of town. Team One claimed victory, and First Prize selection went to Everett Chun, who chose the classic Gutshot Logo T-Shirt. Second Prize went to Troy Roper, who walked away with the Gutshot Tote Bag. 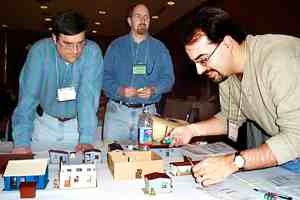 We're looking forward to OwlCon 2003! for permission to use the OwlCon logo on our site.